Fancy Stoke scoring from a set piece?! Etherington whips in a corner. There’s some commotion in the box, as Gomes feels that he is impeded in his attempts to get the ball. In truth, Huth stands his ground, although we’ve all seen them given as fouls. The ball finds Faye at the back post, who is marked by Kaboul. It’s tricky to tell who it comes off, but it either comes off Kaboul’s lower leg, or Faye’s toe. You would expect better from Kaboul, but he may not have had the best view, with the ball dropping steeply over Corluka’s head. Fuller beats Huddlestone to the ball, and prods home, with Gomes nowhere. In fairness to Chris Foy, he had an excellent view of the incident. A disappointing one to concede, but Stoke are so well practiced at these. I am going to go a touch easy on Kaboul, because it is his first appearance, and no real harm done. But there are a few basic rules of defending which he did not abide by. Don't let the ball bounce in the area - it was Kaboul's touch that set up Fuller. That touch MUST make the ball leave the penalty box, and he was more concerned about moaning about being fouled. The second mistake was "play it simple", that time when Gomes called for ball, and Kaboul ignored it and took ball - that's ok, but from that point he lost the ball and put under pressure - incredibly frustrating. I hope these will be rare occurances...please. Otherwise he was ok, but not great. 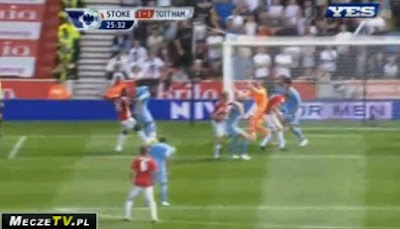 Dawson was also being held (although he didn't appeal) as he tried to get to the ball. Should have been a foul given for that. Also the referee was very lenient with his yellow cards, there were several 'professional' fouls (i.e. no attempt whatsoever to play the ball)in the second half which went unpunished. Its almost as if the weaker teams are given a little leeway so as to even the playing field.